Plastic chairs are sold around the globe. But today, that “plastic” might actually be a vegetable compound as the design world increasingly embraces “green” and “meaningful” production, experts in the field say. “For both consumers and creators, interest in ‘the sustainable’ is growing each year,” said Franck Millot, director of the annual Paris Design Week — a huge showcase for the latest trends in global furnishings and decoration. “A designer doesn’t just create beautiful objects, they also think in terms of improving daily life,” he told AFP. Typical is French architect and designer Patrick Nadeau, a pioneer in urban hanging gardens and plant-based design. “Plants, vegetable material, with their colours, their matter, their translucence, they help create awareness, a living, evolving framework,” he said. In France’s Champagne capital of Reims, he won kudos for an environmentally friendly social housing project. Despite strict budget constraints, the homes were all made of wood and incorporated plants and sloping earthen walls — as well as optimal orientation — to enhance thermal insulation, lighting and harmony with nature. The concept harks back to the 1920s, when visionary US architect R. Buckminster Fuller advocated that “less is more” and that design should be “anticipatory” to help solve world problems. Fuller’s notions hit home with the 1970s oil crisis. The embargo the Organization of the Petoleum Exporting Countries slapped on industrialised countries over US involvement in the 1973 Arab-Israeli War suddenly cut back supplies. As a result, these nations began to rethink their dependency on oil. For Nadeau, the post-oil “energy transition” is also a responsibility for designers and architects. One who has taken up the challenge is Kartell, the high-end Italian design firm that has upheld plastics as a “vector” of modernity for 70 years. In April, it launched its first “biodegradable” chair made from plant-based waste and microorganisms. “Such eco-design allows you to produce without destroying, it’s part of our strategy for the future,” Kartell president Claudio Luti told the French daily Le Monde. The switch often involves a high-tech reinterpretation of age-old plant matter like linen fabric from flax, hemp, jute, seaweed and vetiver, an easily woven fibrous root common in Madagascar now much in demand in Europe and the United States. Centuries ago, resistent linen was pressed in successive layers to make armour for Alexander the Great and painting canvas for the world’s great masters. Today it is mixed with resin to produce snowboards, chairs, helmets and car doors — an eco-friendly substitute for products once reliant on fossil fuel-based carbon and plastic-based fibreglass. Similarly, tough jute is used to produce the solid hulls of boats. Other materials find a second — often classier — life through “upcycling“, a movement to repurpose old or discarded objects so they do not add to the world’s garbage mass. 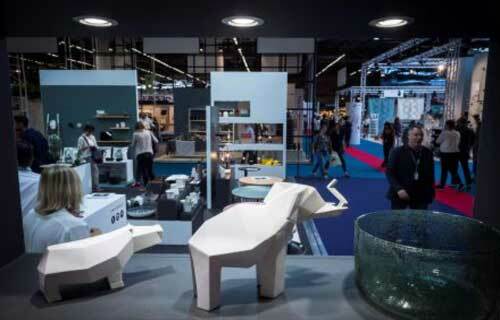 One specialist at the Paris Design Week was a Dutch firm with the motto “from waste to wonderful“. Called Rescued, it offers everything from paper chandeliers made of printshop waste to chair cushions fashioned from old blankets. Luxury firms have also joined the trend, like Hermes whose “Petit h” laboratory recycles its high-end scraps for resale as mug holders, bracelets, even leather pinwheels. One French designer adds modern bells and whistles such as wifi and bluetooth to big old vintage radios. Along with “upcycling”, another mantra these days is “Slow Design” — which took its cue from the Slow Food movement — “a holistic, sustainable approach that emphasises the long-term benefit of products and their impact on the well-being of consumers and the planet“, said Design Week director Millot. With “Slow Design”, “there is renewed interest in old-fashioned knowhow and craftsmanship, objects that have a history, where there is a human touch and a desire for reasonable consumption,” he said. Millot concedes that touting ecology in what is basically a product-driven sales sector may be contradictory, but says he feels the young generation of designers are more “aware of the stakes”. They include French industrial designer Julien Phedyaff who in 2014 created a washing machine dubbed “Unbreakable” — which won him the prestigious James Dyson award, named for the British inventor best known for his vacuum cleaners. Designed to last a half a century, the machine comes in a kit to be put together and taken apart when parts need replacing or repairing — Phedyaff’s direct challenge to “planned obsolescence” in high-tech items and household appliances whose manufacturers are often accused of deliberately limiting the lifespan of their products. Two years on, he is looking for partners to help commercialise his product.